Mile 115 and Glennallen keep your eyes peeled for caribou . 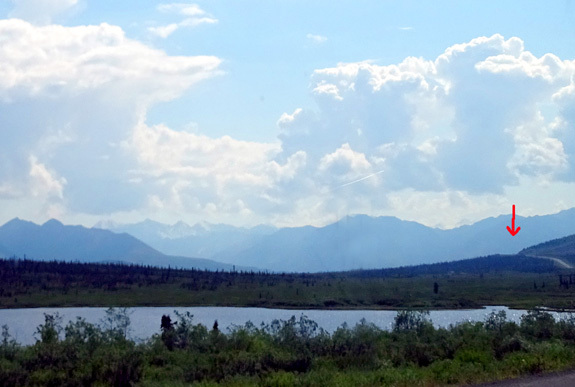 . ."
Although we didn't see any sheep or caribou today, we enjoyed seeing this part of the Glenn Hwy. again. 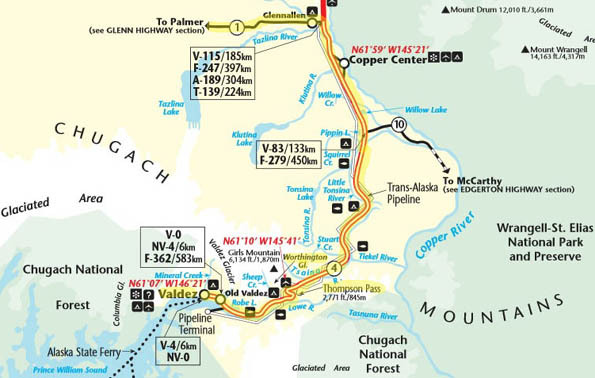 We traveled westbound once in 2012, also from Valdez to Anchorage. 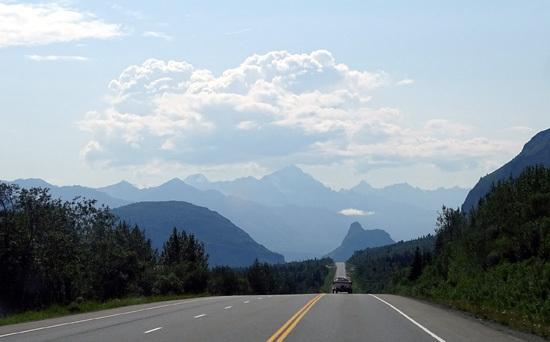 We haven't gone eastbound yet, the direction where travelers can better see the Matanuska Glacier and River. 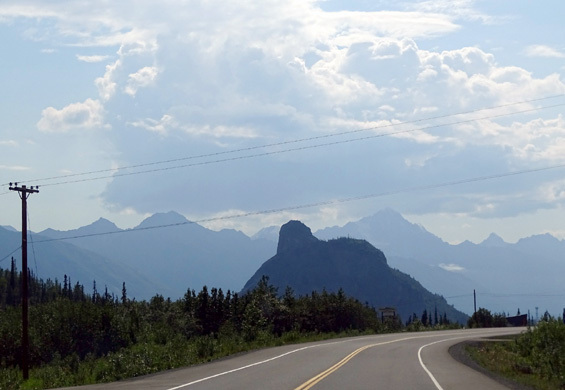 You've already seen photos of the stunning mountain scenery along the Richardson Hwy. (AK 4) between Glennallen and Valdez. 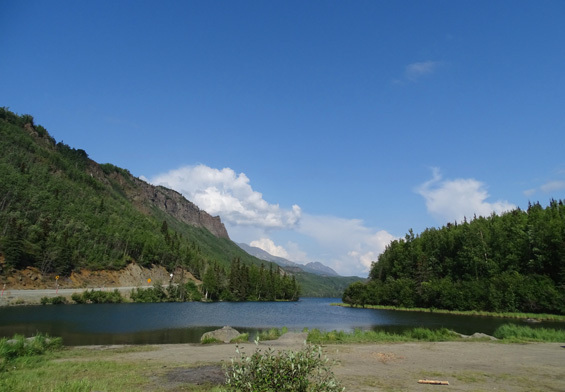 Today we drove that section northbound, then turned west onto the Glenn Hwy. 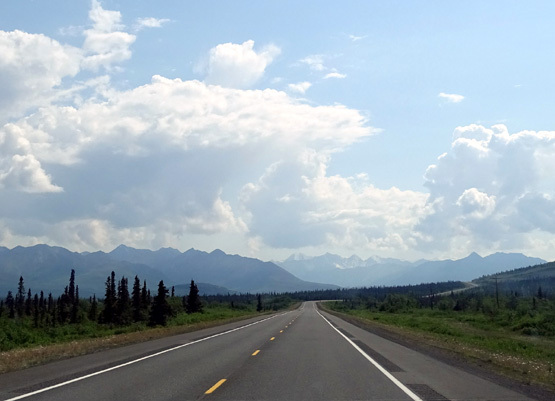 (AK 1), a National Scenic Byway, to the northern part of Anchorage. 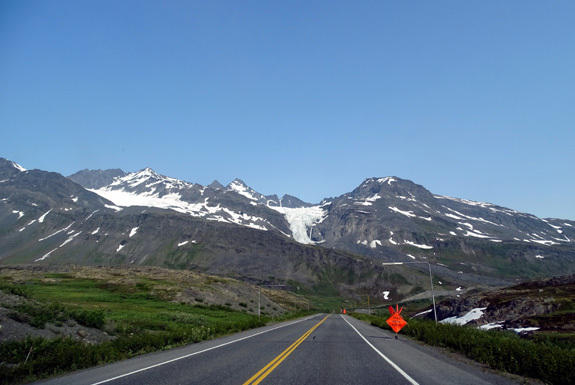 The Chugach Mountains to the south and Talkeetna Mountains to the north guarantee more beautiful glaciated Alaska scenery on this section of road, too. Tahneta Lake; Tahneta Pass is under the arrow in the distance. 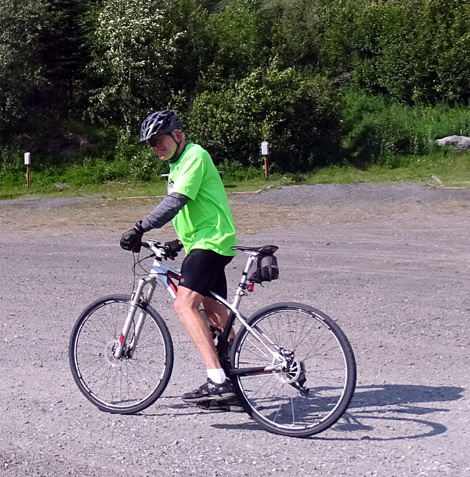 Jim will be riding a 100-mile bike race on the Glenn Hwy. 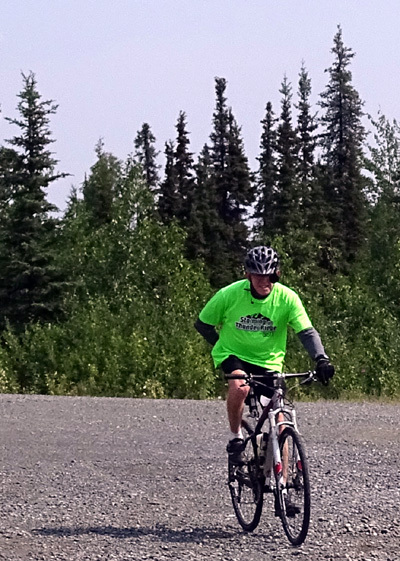 in July, part of the Fireweed 400 cycling event. 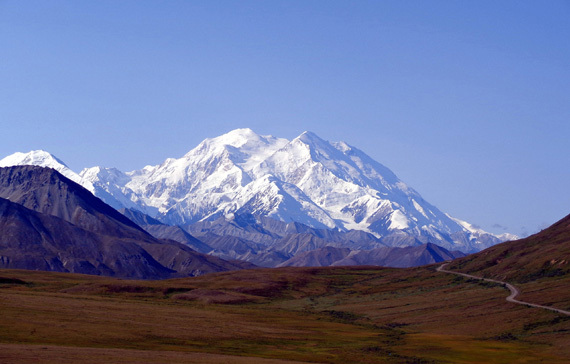 His race goes 50 miles east from Sheep Mountain (near the Matanuska Glacier) and 50 miles back. Since we would be covering that section of highway today, Jim got the bright idea to ride 48 of those 50 miles on his bike while I drove the camper forward, crewing for him along the way. Despite some long ups and downs he did great and feels more prepared for his race. 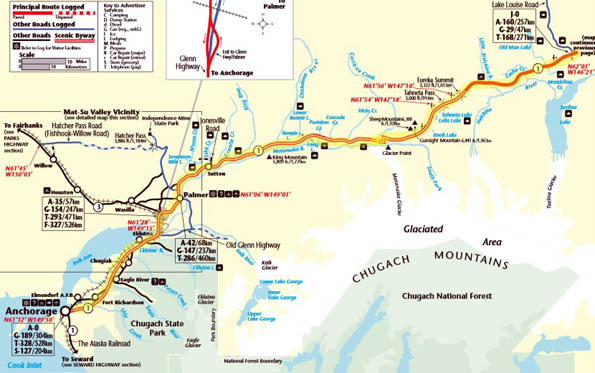 Map sections are from The Milepost website; read this one from south to north. Read this one east (R) to west (L). It was a long but fun day with lots of stops and Jim riding his bike 48 miles on the return portion of the "Fireweed 400" 100-mile race he's doing July 10. I crewed with the camper, not an easy thing to do with a moderately large 5th-wheel coach in tow. TRAFFIC & ROAD CONDITIONS: light traffic between towns; moderate traffic near Valdez and Glennallen; moderately heavy in metro area from Palmer to Anchorage. 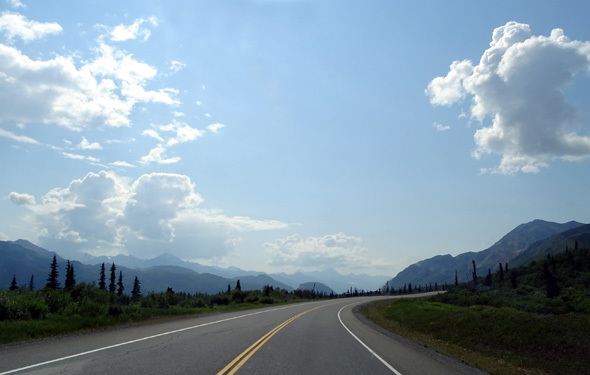 The road from Glennallen to Anchorage was in good condition for both RVs and bikes! 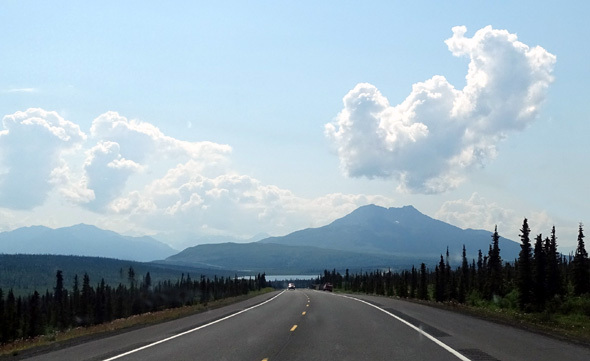 Heading toward notched Gunsight Mountain on the Glenn Hwy. We forgot that the 25 miles from MP 99 to 74 on the Glenn Hwy. 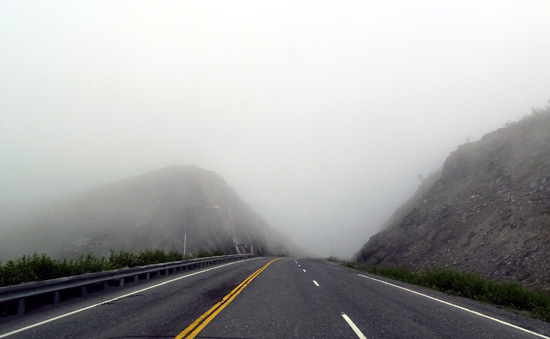 are as narrow, curvy, and high up as they are past the Matanuska Glacier and above the Matanuska River. The views were stunning but I was on the wrong side (passenger seat) for photos. I hope to get better pics going eastbound when we go that way for Jim's bike race in July. Fog obscured just about all the scenery to the pass, then as soon as we began descending on the north side it was suddenly clear! 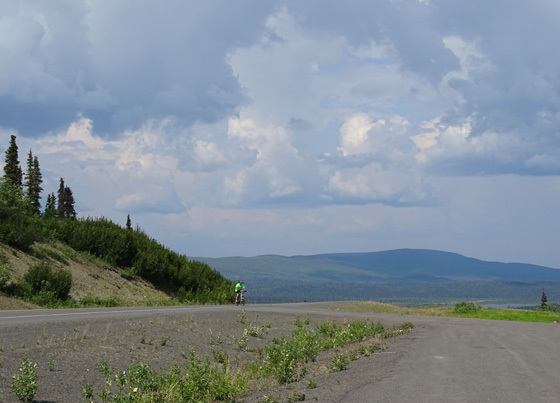 Temps were in the 60s and 70s F., the sun felt hot, and there wasn't much breeze until we got to Sheep Mountain Lodge, where Jim finished his ride. 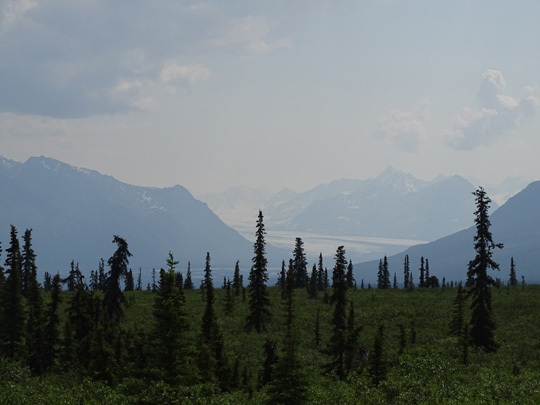 There was so much haze over the Wrangell-St. Elias Mountains, probably from a large wildfire in that wilderness, that we couldn't see the 12,000-16,000-foot mountains there. TERRAIN: mountainous the whole way but no real long ups and down because we were riding above 2,000 feet most of the time. There were two passes about 3,000-3,300 feet in elevation that are on Jim's bike race course; they weren't as tough for him to ride up as he expected and they were hardly noticeable as I drove the camper. This is a gorgeous drive in clear weather. 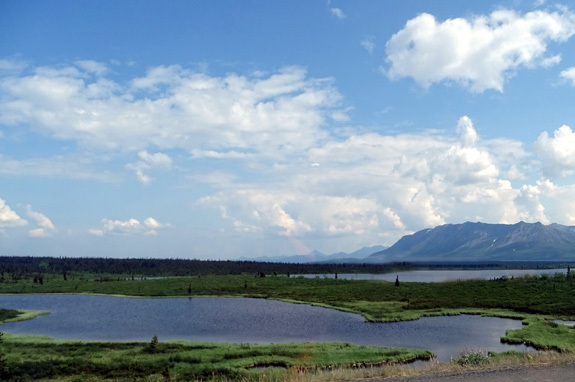 The nearby Chugach and Talkeetna Mountains on the Glenn Hwy. 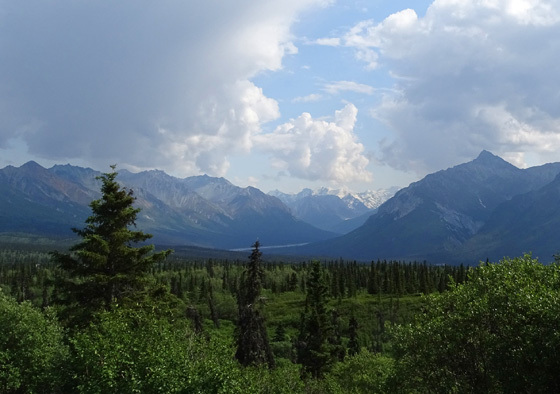 aren't as dramatic as some of the mountains we've seen going to Haines, Skagway, and Valdez but they are still beautiful. Matanuska for several miles before and after MP 101, and Knik as we got near Anchorage. I love glaciers! 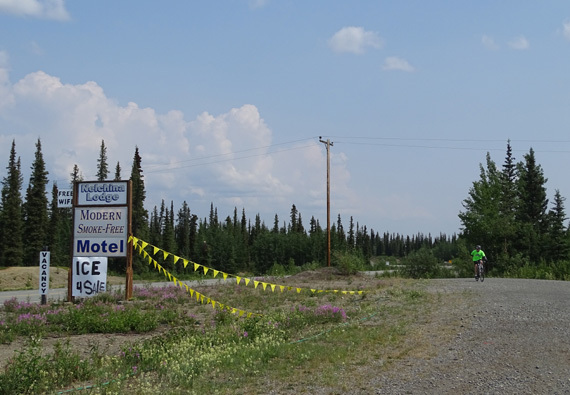 Jim got on his bike at MP 162 on the Glenn Hwy., the turn-around point in his race, and rode 48+ miles to the Sheep Mountain Lodge, the start/finish at MP 113. He wanted me to pull the camper over about every ten miles in case he needed to stop for some reason -- road work, inadequate shoulders, too much traffic, fatigue, whatever. The Nelchina Lodge has a nice big parking lot; I asked permission to wait there. Jim looks great after the first 19 miles (and at the end of 48, too). The next place I stopped was about 32 miles (Eureka Pass), then 40 miles (Tahneta Pass), and those were comfortable distances for him. I stopped at some other places near the end for photos of scenic mountains and river valleys. 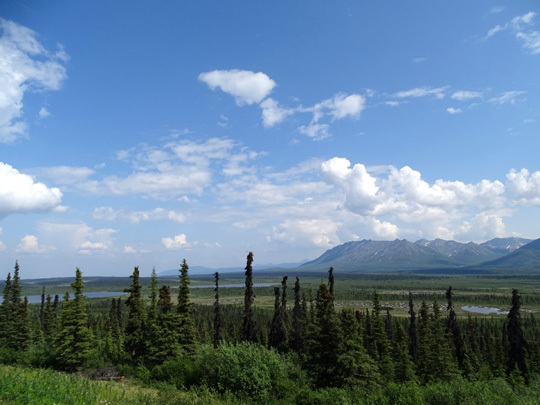 A good reason to live fulltime in our rolling residence: great Alaska views! There are lots of fireweeds beginning to bloom on this stretch of the highway. 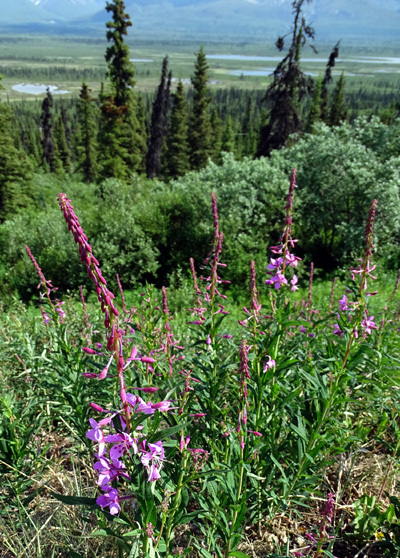 The Fireweed 400 is named for these colorful, ubiquitous summer flowers. 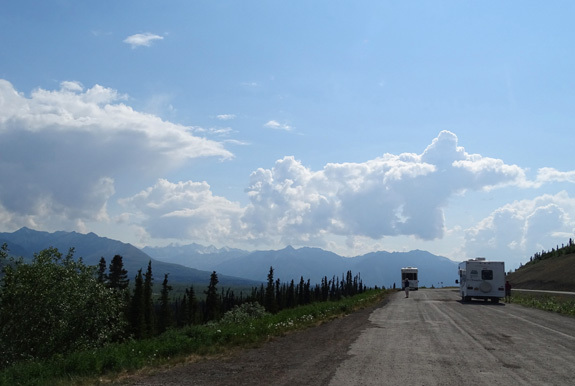 The pullout at Tahneta Pass was a great place to walk the dogs and talk to other RVers who came and went. 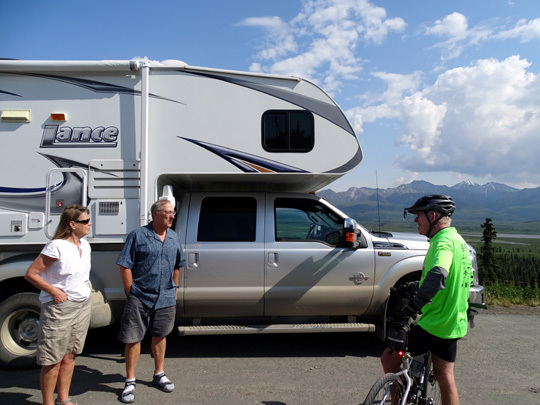 I had a pleasant conversation with a couple and their daughter from Haines Junction, Yukon, who were in a truck camper. They like to vacation in Anchorage for a week every summer. That gave Jim a nice little break and then he continued riding westbound to Sheep Mountain Lodge. which is called Glacier Point or Lion's Head. 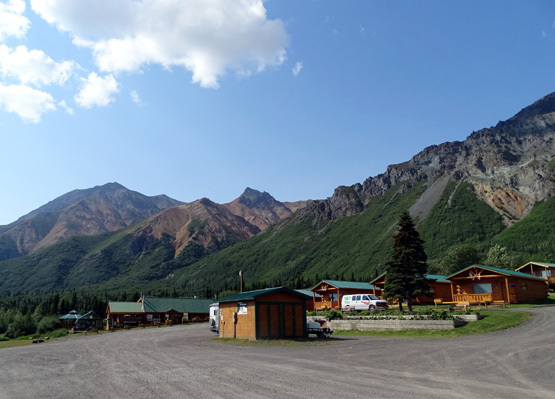 When I pulled into the large parking area at Sheep Mountain Lodge I went in to ask permission to wait there for Jim, explaining that he was training for the Fireweed 400 and would be coming in fairly soon. The 100- and 400-mile races in that event start and finish here; the 200-miler ends in Valdez. Above and below: done! Hope the weather is as good on race day in July . 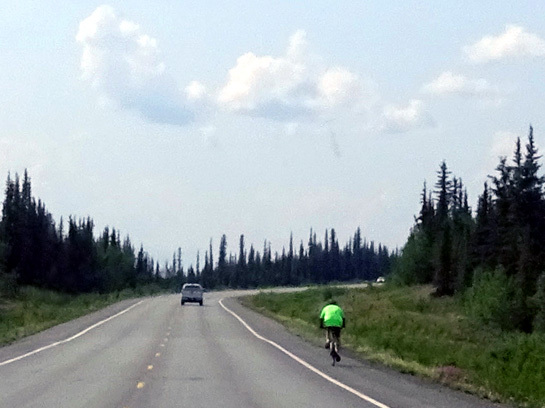 . .
Jim ate an early supper, rested a bit, and then we continued down the road (literally) to Anchorage. We dumped gray and black water before leaving the Valdez Glacier Campground this morning and Jim got about 25 gallons of fresh water. 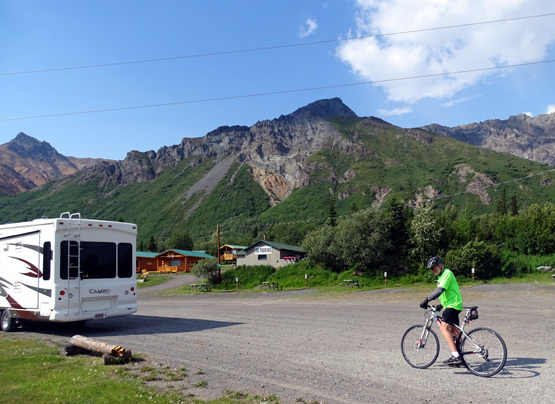 We thought we might spend the night along the highway near Sheep Mountain or the Matanuska Glacier but Jim felt good enough after riding his bike 48 miles to drive another 90+ miles to Joint Base Elmendorf-Richardson (JBER) just north of Anchorage. 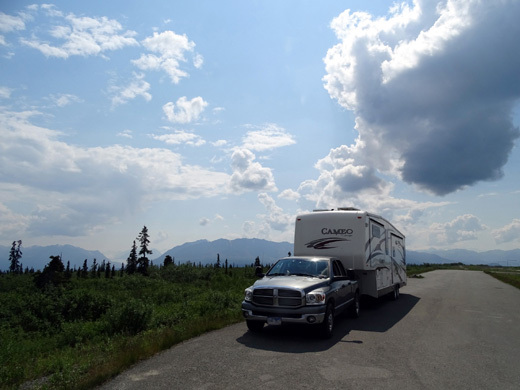 When we got to JBER we headed straight for Black Spruce Campground on the Richardson side of the base. We stayed here three different times in 2012 and prefer it to the campground on the Elmendorf side. 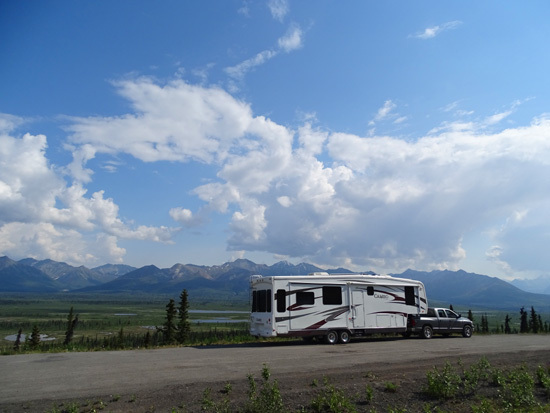 RVers can't make reservations at JBER so we were very happy to get a full-hookup site again. We knew that about half of the sites at Black Spruce are currently without electricity so we assumed all the FHU sites would be occupied. Since we have a good site, we plan to stay here a little over two weeks. We'll return one or two more times this summer between short trips to other parts of the state. After the long day we had, I was very surprised when Jim decided to do laundry at 9:45 PM! It's still light then but geez, aren't you tired yet??? Obviously not. That's a good sign for his upcoming race. 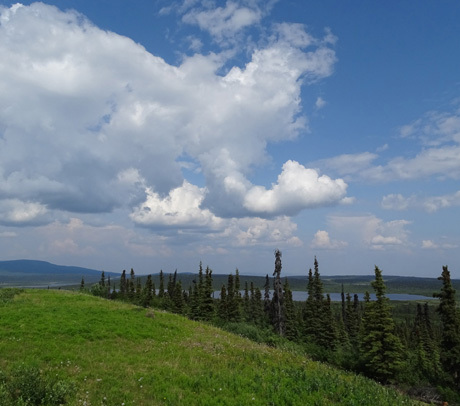 Next entry: more about camping at Black Spruce and our activities on the large JBER (Joint Base Elmendorf-Richardson, acronym pronounced JAY-bear).